Who will I be talking to on the hotline? During the weekday, our hotline is answered by Julie Valentine Center staff. When the center is closed, our hotline is answered by Mental Health America, who will take your phone number and have a trained Julie Valentine Center volunteer advocate contact you within 10 minutes. When can I call the hotline? Everything a client discusses with Julie Valentine Center staff or volunteers is kept private between that client and our agency with very limited exceptions. Confidential information may be shared to the appropriate agency in the event that: the client threatens to harm themselves or others or if the client discloses child abuse. Julie Valentine Center advocates are available 24 hours a day, 7 days a week to support survivors and their families and friends during a visit to the emergency room for a medical examination or evidence collection process after a sexual assault. Hospital staff at all emergency rooms in Greenville County should offer to contact an advocate on a survivor’s behalf. If that option is not presented, the survivor may also request one by calling the hotline at 864.467.3633. An advocate is available to you regardless of whether you wish to report the assault to the police and an advocate from the Julie Valentine Center can answer questions about the options you have for reporting, having evidence collected, without making a report and other options. 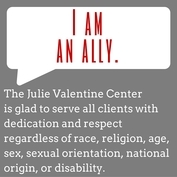 Advocates from the Julie Valentine Center are available to support you through the criminal justice process. This includes assistance reporting to law enforcement, accompaniment to law enforcement or Solicitor’s Office interviews, courtroom support and accompaniment during legal proceedings, assistance obtaining a restraining order, information about the criminal justice process and other support. Those who have experienced sexual violence often don’t know what to expect when they go to the police to report the crime or from the system after that report is made, and the process can be intimidating and difficult. Advocates can help by providing support, knowledge and access to resources. An advocate is not your lawyer. However, the Julie Valentine Center has trained advocates who are familiar with the criminal legal system and who can keep you informed of your rights and provide support during the criminal legal process. Our victim advocates will provide assistance with issues related to sexual assault, including employment or medical issues; case management; assist client in applying for SOVA benefits; provide referrals to community resources for housing, substance abuse, legal, therapeutic and other needs, as well as completing intakes for therapy services at JVC. What enables us to provide these services at no charge? Who covers expenses when a victim goes to the ER? ​Learn more about the South Carolina State Office of Victims Assistance. If you need assistance and are outside of Greenville county visit The South Carolina Coalition Against Domestic Violence and Sexual Assault (SCCADVASA).There you will find agencies across the state that can assist sexual assault and child abuse victims. To obtain an advocate please contact our 24 hour hotline at 864-467-3633 or complete the form below. **We will make every attempt to respond to submissions by the next business day. However, if you need immediate assistance, please call our hotline.